We got a wide variety of announcements today, so let’s start off with the most exciting news first. For those (like me) who thought this was a one time mini set, in comes part 2 proving us all wrong. 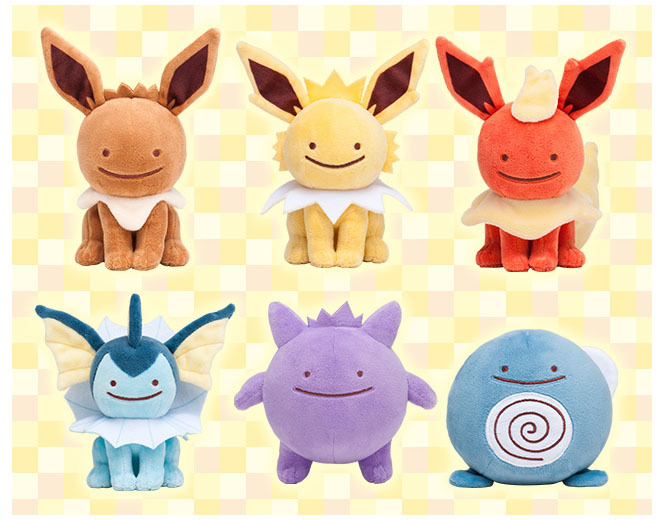 This second set of Ditto faced Pokemon will, like the first set, be available in two sizes: normal and mascot, and the line-up features Eevee, Flareon, Vaporeon, Jolteon, Poliwag, and Gengar. Part 2 of the very popular Ditto Transform series will go on sale May 7th. 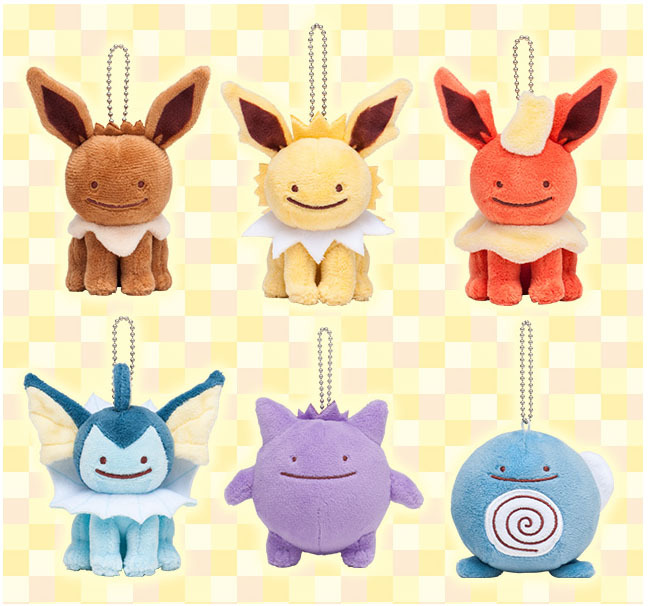 Normal size plush will retail for 1,296 yen and mascot size plush will retail for 864 yen. 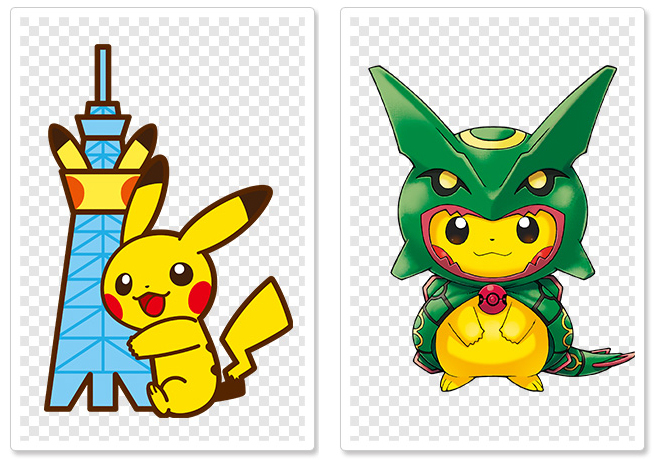 A new Pokemon Center will open at the base of the Tokyo Sky Tree on July 6th (Wednesday). 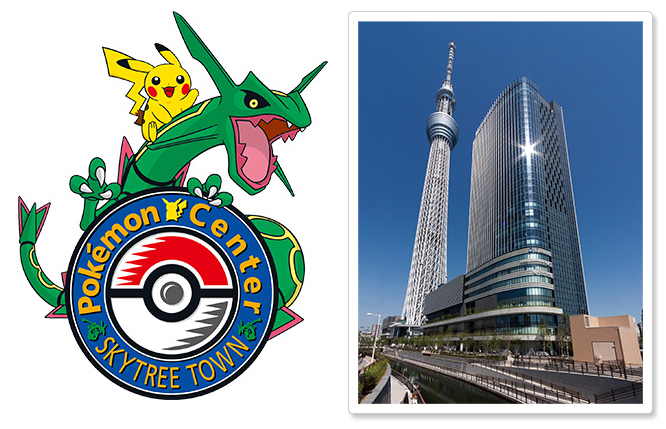 The Center, hereby known as “Pokemon Center SkyTree Town” features Mega Rayquaza on the logo alongisde Pikachu. Using the other brand new Pokemon Center promotions as references, it’s a pretty sure bet this Center opening promotion will feature Mega Rayquaza poncho merch, so if you like Mega Rayquaza, stay tuned for more information! 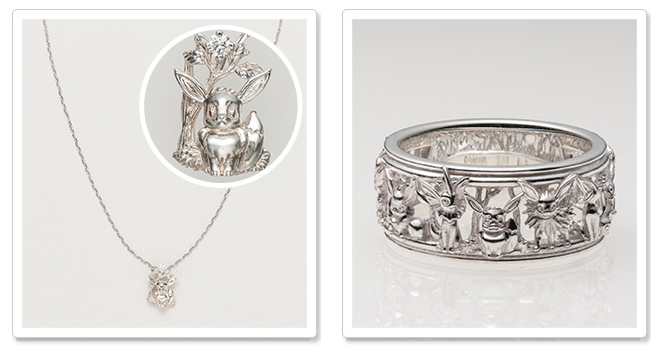 For all the fans of the K.Uno Pokemon jewelry collaborations, a new necklace charm design featuring Eevee and a ring featuring all the Eeveelutions will be available for pre-order exclusively through the Pokemon Center’s on-line store. As with previous jewelry sales, these pieces will only be available made to order. The pre-order period starts April 23rd at 10 am and will end June 30th at 11:59 pm. Each piece will be available in silver, yellow gold, and pink gold. 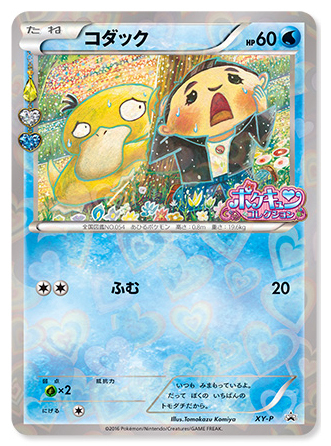 Masuda is currently doing a signing tour at all the Pokemon Centers around Japan, and as a bonus part to the tour, all Pokemon Centers, shops, and stores around Japan will be giving out these limited event PokeKyun cards, featuring an illustration of Masuda and Psyduck (his favorite Pokemon). These cards will only be distributed on days that signing events take place. To get one, simply go to a Pokemon Center, store, or shop on one of the designated days and buy 5 booster packs from any card series. Stay tuned for this weekend’s Pokemon Center report! I would probably ask $340~$350 before shipping but unfortunately I can’t help with orders because I won’t be in Japan when the jewelry is mailed out. If you’re seriously considering ordering a ring, they are only ordered via the on-line store ; you can do it yourself if you use a forwarding service like tenso.